The first school house was located in the parish and district was destroyed in 1689. The bridge subsequently in the narrow streets towards the guest house "Swan" was by cheap materials soon floundering. 1827, the foundation for today's castle for two school teachers with four classrooms and a teacher's residence are laid. Due to the growing number of students you have already been forced in the second half of the 19th century to a new building. 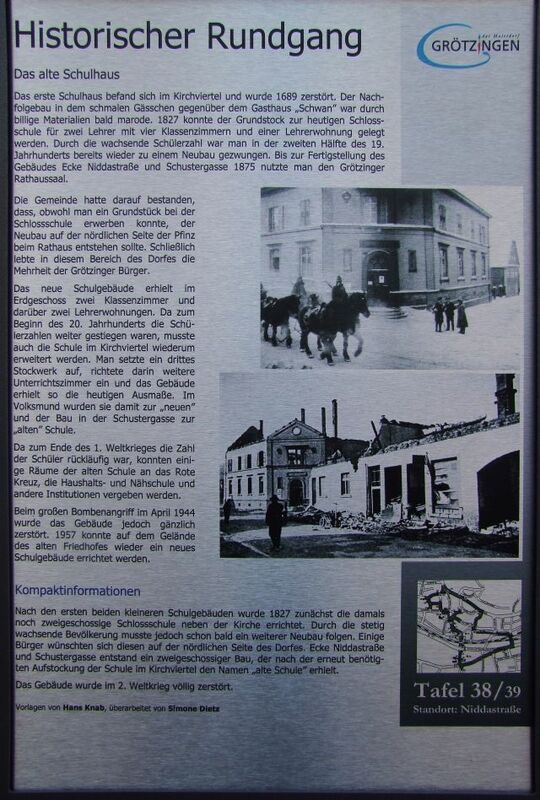 Until the completion of the building corner Niddastraße and Schustergasse 1875 we used the Grötzinger Town Hall. The community had insisted that, although you could buy a plot of land at the Castle School, the new building on the north side of Pfinz should occur at the Town Hall. Finally, in this area of the village lived the majority of Grötzinger citizens. The new school building was two classrooms and two teachers about apartments on the ground floor. Since the early 20th century, the number of pupils were increased further, had to be extended and the school district in the parish again. They sat on a third floor, taught in a more classrooms and the building so was the present dimensions. In the vernacular, it thus became the "new" and the construction in the Schustergasse to the "old" school. The end of the first world war because the number of students has declined, some rooms of the old school to the Red Cross, the household and sewing school and other institutions could be forgiven. At the big bomb attack in April 1944, the building was completely destroyed, however. 1957 could be built on the site of the old cemetery again a new school building.